A serial entrepreneur, public official, director, prolific author and long-time agitator, his lifework has been delineating the underlying dynamics of corporate power and devising system that integrate wealth creation with the interests of society. Citizens DisUnited is a clear call to action. I hope my review advances that call by emphasizing the need for every investor, every citizen to get involved. In 1991, when Power and Accountability was released, I headed Legislation and Regulations for a department within CalEPA. As I was drafting bills with Western States Petroleum, Chevron, Dow, the California Manufacturers and Technology Association, the California Chamber of Commerce, the Chemical Industry Council of California and others business affiliated groups (along with a token representative from the Sierra Club or other overstreched environmental group) , the words of Monks and Minow rang true. I’ve been trying to make corporate managers and directors “accountable” ever since. There is no such thing to my mind… as an innocent stockholder. He may be innocent in fact, but socially he cannot be held innocent. He accepts the benefits of the system. It is his business and his obligation to see that those who represent him carry out a policy which is consistent with public welfare. The central point of Citizens DisUnited is that we, the owners of America’s corporations, have abdicated our responsibility. Just like most banks no longer hold actual mortgages like the Building and Loan in Its a Wonderful Life, we have also sliced and diced our stock holdings to the point where it is not worth it for most of us to monitor the companies we own either through mutual funds or more directly. 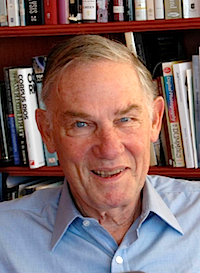 On the advice of John Bogle, we have increasingly invested in indexed funds. While that works for individual investors, at least up to a point, collectively it means that no one in the chain of ownership has an incentive to care about corporate governance. Bogle has nothing but the best intentions. Unfortunately, the move to index funds has unintended consequences. If Vanguard, Fidelity and BlackRock each own 1% of a company, any changes Vanguard makes at that company will benefit all three funds (their competition) equally but Vanguard will incur all the expense. Therefore, most funds are rationally passive. Seven decades ago, Adolph A. Berle warned that granting managers free rein posed the “danger of a corporate oligarchy coupled with the probability of an era of corporate plundering.” Both fears have been fulfilled in our own time, but this takeover hasn’t happened in a vacuum. Passive index funds, algorithm trading, the incessant churn of financial markets around the world have all served to weaken the bonds of ownership and divorce shareholders from any compelling sense of responsibility for the corporations in which they have invested. in the sense that they are untethered from reality and responsibility. We define them as corporations, “in which no single shareholder retains a principal position, defined by the SEC as 10 percent or more.” The owners aren’t at the helm — but manager-kings are. And there are no limits to prevent these CEOs from enriching themselves at the shareholder expense or from shifting the burden of externalities onto society… Like its namesake weapon, the multinational corporation has vast power. It externalizes collateral damage. Neither weapon not corporation is subject to terrestrial restraints. And both are controlled remotely by a small body of persons entirely removed from the consequences of their actions. Drones are more likely to have other, active corporate CEOs on their boards. Drones are more likely to have present and former CEOs on their compensation committees. Non-executive director shareholdings at corporate drones average less than half the value of non-drone counterparts. Drone CEOs are almost 50% more likely to be named Chairman of the Board. Drone CEOs out-earned non-drone counterparts by nearly 50%. Drones are more likely to avoid paying taxes. Drones laid off nearly 50% more workers over the same reporting period. Drones are twice as likely to have frozen or eliminated employee pension plans since 2005. Drones are twice as likely to have paid regulatory fines and settlements during the last 20 years. Drones dramatically under-performed in terms of investment returns to shareowners by a collective 23% over the last five years. The drone analogy is a helpful way of thinking about companies where shareowners have unwittingly abdicated their responsibilities to CEOs and entrenched boards. However, I also suspect at least a portion of the differences we see between drones and non-drones may have something to do with the newness of many non-drone companies. New companies aren’t as likely to be in dirty industries subject to environmental or safety compliance fines. New companies don’t lay people off as frequently. New companies, at least those that make it to the S&P 500, are likely to be more profitable than older companies because their patents haven’t expired and their new ideas hhaven’t met as much competition. Are companies like Zynga, Facebook, and NewsCorp really more responsible? For a contrasting study, see Controlled Companies in the S&P 1500: Performance and Risk Review, which found non-controlled firms outperform controlled firms over a 10-year period. The type of control matters. Those with a single class of shares did well. However, controlled companies with multiple share classes generally underperform over the long term, are perceived as having more financial risk, and offer fewer rights to unaffiliated shareholders than firms owned by dispersed shareowners. This is a minor quibble and in no way takes away from Monks’ point regarding abdication of responsibility. He has written many books on the theme of owners and accountability. As he does so again, I hope he will further parse the evidence presented here. What type of owners take monitoring seriously with results that are favorable to minority owners and society? For example, based on books such as Citizens DisUnited, Firm Commitment and Owning Our Future, my wife and I recently invested in Novo Nordisk, where the controlling ownership stake is held by a foundation. Novo holds 73.5% of outstanding votes but only 25.5% of outstanding capital through multiple classes of shares. That structure could be devestating, if the foundation gets off-course. We are hopeful their focus on diabetes and biopharmaceuticals will provide proper motivation to continue their focus on mission. However, most companies are not controlled by noble foundations or a founder with true social vision. The key point of Citizens DisUnited is that freedom from responsibility has important consequences. Indexing and algorithmic investing yield average or slightly above agerage returns at lower cost, but they have also led CEOs and insular boards to usurp not only corporate coffers but our governments as well. Monks quotes from Justice Anthony Kennedy’s majority opinion in the 2010 Supreme Court case of Citizens United v FEC, which limited the government’s ability to constrain corporate expenditures for political purposes. The quote demonstrates a partial justification for the Court’s opinion was the ideal of internal democracy within corporate governance. Of course, I strongly disagree with the decision but Kennedy’s opinion does reinforce my own long-standing belief that real democracy depends on more than just a democratic government. It depends on democratic structures and mindsets throughout society, especially in the operation of corporations, which have so much influence on other social institutions, including governments at all levels. As indicated above, Monks, the consummate insider with plenty of outsider tendencies, does a better job than anyone in laying out the problem, the unintended consequences of shareowner indifference to governance responsibilities. He also offers solutions, which he readily acknowledges are not all-encompassing. The purpose here is not to pinpoint the One Answer to the current crisis of corporate governance but to launch a process by which the answer (or more likely answers) might emerge. Those of us who grew up influenced by Thomas S. Kuhn’s The Structure of Scientific Revolutions may recognize the need for something of a paradigm shift in corporate governance. Recall that before an old paradigm is rejected, a new option has to present itself as superior. That generally takes place after a reconstruction of group commitments around the abandonment of tautologies. For example, how useful as a concept is board independence? Independence, at least as defined by the stock exchanges doesn’t seem to add much predictive value in developing models of which companies are more accountable or perform better. Perhaps it is more important that directors be dependent on and accountable to shareowners. Everyone! Individual shareholders by their vigilant attention and carefully considered proxy votes. Fund managers by their close parsing of the public records of political contributions and return on investments, and the more private and often intuitive ones of the effectiveness of governance at the corporiations toward which they director their funds’ resources. Even the media and online watchdogs, by bringing to public attention the wretched excesses and imperial ambitions of so many corporate manager-kings. Those who can make a true and lasting difference – who can lead the charge, who can raise the flag that others follow – are perilously few: not the funds per se, not their hired managers, however handsomely rewarded, but the trustees who stand behind them and are both legal owners of the entities and moral owners of their actions. They, the trustees, have ultimate power, and thus they have ultimate responsibility and accountability. to have known vast harm was being done and to have had the power, standing, and resources to intervene, and yet to have failed to act. That is a shame not easily overcome, for the individual or for the society that allowed it to happen. Unfortunately, shame seems to be a foreign concept to many in the top 1% and few are willing to be a “traitor” to their class, as Robert A.G. Monks has been. 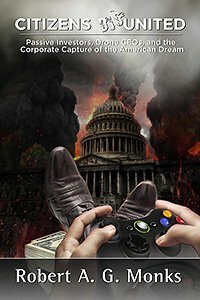 (A Traitor to His Class: Robert A.G. Monks and the Battle to Change Corporate America ) Whatever turmoil climate change or other catastrophes bring, the sons and daughters, as well as the grandchildren and great-grandchildren of today’s elite endowment trustees are likely to be relatively better off than the masses. It is certainly worth the call; some may be moved to action. For the rest, it seems likely to take far more pressure than shame or the possibility of future regret. In addition to shame, Monks depends on a recognition by these elite trustees that either they stop pillaging the corporate treasuries or there will be blood in the streets. But even if the masses pry themselves from their TVs and video games, they aren’t likely to overthrow the power of drone corporations, controlled “by a small body of persons entirely removed from the consequences of their actions.” As Monks admits, the power of states, laws and nation are “neutered by the vast asymmetry between the stateless global corporation and the necessarily confined nation-state.” My guess is that average retail shareowners will see the problem well before elite trustees who are more insulated from the fallout of corporations externalizing costs. Near the end of the book, Monks rejects two “solutions.” I’m with him on divestment. Divestiture is tantamount to declaring moral victory, deserting the field of battle, and leaving festering in place whatever was offensive enough to merit the divesting, along with CEOs who frankly don’t give a damn who owns the stock as long as someone does. Divestment is popular with those who don’t understand the vast majority of stocks are purchased on secondary markets. The proceeds of out investments go to share sellers, not to companies. The impact is generally small, except in rare instances, such as when combined with boycotts of companies doing business in South Africa. I recently wrote to the CalPERS Board, advising them to oppose California legislation that would ban their investment in nonmilitary gun manufacturers. While certainly well intentioned, Assemblyman Dickinson’s measure would be counterproductive to his own purpose. If the thinking caring Board of CalPERS agrees to divest of companies manufacturing guns for nonmilitary purposes, CalPERS will only end up selling its shares to those with fewer moral qualms. Better to be arguing from inside these companies, as an influential shareowner, than from outside with no effective voice. There is justified public outrage over guns, heightened by the recent tragedy at Newtown, but America isn’t about to stop manufacturing guns. The most we can hope for at this time is tighter controls on who gets them and, if we a lucky, a ban on certain types of guns and ammunition. Divestment often worsens a bad situation. The atom of ownership is too smashed, and the proxy system through which corporate voting is carried out has been too corrupted to give any hope of a democratic resolution to the multiple ills of corporate governance today… proxy voting is the moat around management, not the bridge into the castle. We’ve made substantial progress, in large part due to Monks’ efforts. Most S&P 500 companies have declassified their boards, redeemed poison pills, require majority vote for directors and no longer require supermajority votes. Yes, proxy mechanisms are flawed (votes left blank go to management). Yes, we have agency capitalism with little incentive for agents to monitor, but fixes are available and forthcoming individuals will just gather together and demand change. Don’t give up on democracy as a force within corporate governance. That would be like the Greeks refusing to perform the duties of citizens. The irony here is that Monks provided us with the best tools we have to bridge that moat to the castle. His role was key in establishing that proxy votes be treated as assets. Therefore, funds must vote in the interest of beneficiaries and investors. Because of Monks, mutual funds and investment advisors must report how they voted, which is critical if we are to hold them accountable. Because of Monks, proxy advisors now analyze each issue and provide at least some reasonable balance to the advice provided by company management. His LENS fund showed there is money to be made in good governance. His GMI Ratings is helping to establish a better form of index funds based on risk and measures of good governance. And of course his books continue to inspire new generations to strive for a better, more sustainable world through the mechanisms he put in place to enable more democratic corporate forms. Here’s my hopefully premature lament to Monks: “O Captain! My Captain!” the prize we sought is not yet won. As the strongest member of the crew, you set an clear and courageous course. Charles River and the Thames were mere warmups. The goal is now in sight. Rise up and hear the bells. Flags will be flung and for you the bugle trills. Monks concludes by acknowledging that elite trustees can’t do all the heavy lifting. He recommends greater use of mutual banks and insurance companies, legislation to require Super PACs to report major donors, the Shareholder Protection Act to require shareholder approval of political contributions, a Constitutional amendment separating Corporation and Government similar to the First Amendment separation of Church and State, stripping “legal person” status from corporations, etc. Recognizing the virtue of index funds as low-cost long-term shareholders, Monks pins at least some hope on the idea of a bonus dividend for shareowners committed to long-term ownership. The additional revenue from a two-tier structure “could finance the infrastructure necessary” for taking ownership responsibilities. Like an optometrist, Robert Monks has clarified our vision, highlighting the dangers of irresponsible owners who slice and dice their portfolios to the the point they are not worth monitoring. Like an architect, he presents several model reforms that could result in more profitable, responsible and sustainable corporations. One he emphasized the most, which may have the most promise, is his call to those 24 highly influential foundations and university boards. Success will require work from both sides. Most retail investors toss their proxies. Most institutional investors only vote because Monks helped establish their legal obligation to do so. However, although he was successful in requiring them to vote, all they need to is follow the heard… voting with as much thought as a prudent person would do under like circumstances. In other words, if other trustees are making little of no effort then no effort is required. Trustees are safe if the stay in the middle with the other lemmings. If they actually heed Monks’ call, they face legal risks, however minor. I don’t have Monks’ connections so can only be of limited assistance in contacting targeted trustees. Even these “thoroughly decent and concerned individuals who have already contributed hugely to human welfare” must constantly be reconnected to the mass of humanity through democratic mechanisms. Trustees of all kinds behave better when they can be held accountable or as Nell Minow, Monks’ partner in several ventures and books has famously said, ”boards are like subatomic particles—they behave differently when they are being observed.” Let’s take an example Monks raises, the Harvard Management Company (HMC). HMC is governed by self-perpetuating board of trustees, appointing new members to fill its own vacancies as the need arises. Although the HMC has agreed to create a social choice fund and to hire a Sustainable Investment Officer, Responsible Investment at Harvard has gone ahead and started The Fair Harvard Fund on their own, dissatisfied with with HMC’s commitment. In a post last week (Fair Harvard Fund Makes Progress: Alternative Endowment Should Be Permanent & Democratic), I advised them to set up a permanent alternative endowment, elected by contributing Harvard alum, faculty, and students. I would bet that everyone involved would be more engaged and would increase donations if they had a real voice in electing the fiduciaries investing their money. I agree with Monks that because of its pervasive influence in America, there’s a good chance changes at Harvard’s endowment, and at the other endowments he lists, could lead to subsequent changes in corporations. While we need to convince members of the HMC of the need to change (since they hold all the legal power), the really critical element is demand from below. Those impacted by the HMC must demand a voice and I’m delighted to see Monks advising them. Until the HMC Board is restructured, Fair Harvard may make more progress setting up an alternative, more democratic, structure. The funds offered by Savings Plus operate like mutual funds in that they are invested in a whole bunch of different types of stocks already. Therefore, there are no proxy votes associated with our investment options. Eventually, I was able to obtain what amounts to an unorganized dump of files, confirming CalHR has no voting policies, does not track funds to ensure funds vote in the interest of fund holders and has no documentation whatsoever with regard to monitoring or verifying proxy records. CalHR has determined it has no documents responsive to this request. In addition, please note that pursuant to Government Code section 6253, CalHR is obligated to provide identifiable record or records prepared, owned, used or retained by CalHR; it is not obligated to create a new document. Monks helped to set the legal framework in place for more democratic corporate governance. Now, it is up to us to use it. We can breach the castle if enough of us are willing to ask questions, demand answers, ensure laws are followed and our voices are heard. Readers of Citizens DisUnited will no doubt help lead the charge. As they do, I hope they’ll also be reading my thoughts [see especially: Agency Capitalism: Corrective Measures (Part 2), (Part 3), If I Were on the SEC’s Investor Advisory Committee: Recommendations to Help Retail Investors] and will be getting in touch with me. Let’s coordinate our efforts whenever we can.